This is our base plan, we can customize a marketing plan based on YOUR property and amenities. 1. Pricing Strategy: Prepare a detailed Comparative Market Analysis (CMA) for your property. Review CMA in detail with you to determine the best price as well as best pricing strategies for a successful sale. Calculate net proceeds to you from the sale based on the anticipated sales price. 2. Walk through and Amenity Tour: View/measure your house for proper representation and complete the listing profile outlining every detail of your property. Determine the top three to five features of your property to develop additional marketing strategies. 3. Staging/Packaging the Property for Sale: Suggest and advise you on changes to STAGE your house for marketing. Plus provide tools i.e. brochure, checklists and DVD. Set additional Staging appointment as needed and virtual staging options for vacant homes on the internet. 4. Photos: Unlimited professional photos of the property showing all features/upgrades for the MLS and all marketed websites. Options for Dollhouse, aerial and night photos. 5. Virtual Tours and YouTube Video: Publish virtual tours and YouTube video with music and/or narration uploaded to the MLS and syndicated to 70+ other real estate websites. 6. MLS: Place your property in the Multiple Listing Service (MLS), on line 24 hours a day. Includes NO LIMIT to the number of color photos!! We send you a copy for your approval and suggestions, plus we make up-to-the minute changes and updates to your listing until it is sold! 7. Internet: Have your property listed and enhanced on Zillow.com, Homes.com, REALTOR.com, Azcentral.com and Homefinder.com with photos and expanded descriptions, PLUS 70+ other real estate web sites! 8. Sign: Have a 4x4 post sign professionally installed in your yard for maximum exposure, plus add appropriate sign riders i.e., pool, fireplace, spa, large lot etc. 9. 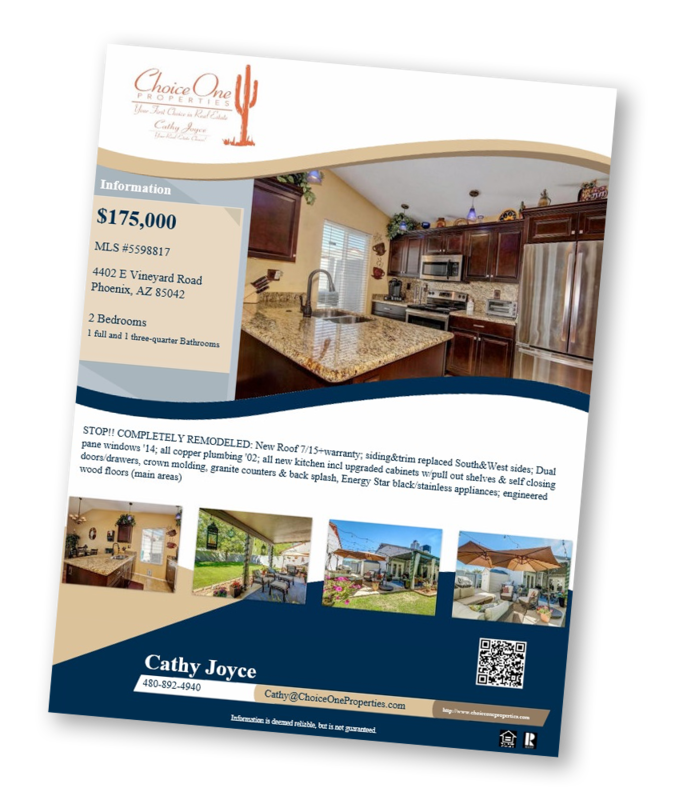 Brochure: Design and print professional four color brochures promoting your property to potential buyers and other Realtors in your market area including a QR Code. 10. Showcase Your Home: As a Premier Agent with both Zillow.com and Realtor.com, our listings get premier status, they are moved to the top of searches and with eye catching banners AND I am the only contact, not multiple other agents who do not return calls/emails. 11. Mass E-mail: "New Listing" emails to Buyers and Leads in our database as well as Realtors throughout your property market area. Again when there is a price change or upgrade. 12. 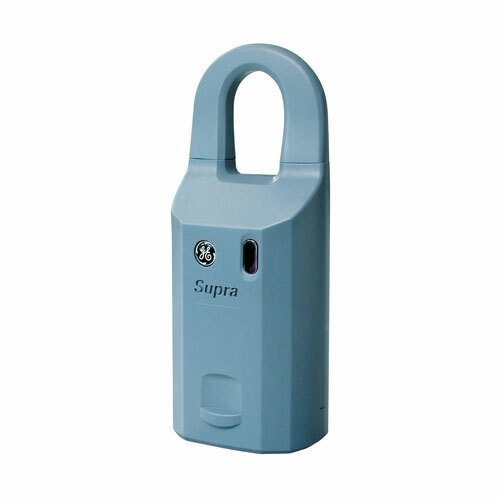 Lockbox: Use of the electronic Supra Keysafe System to ensure maximum exposure and safety of your property through Realtor only access. It records all showings as well as the agent's name, company, date, time and contact information for our DAILY follow up and feedback!!! 13. New Listing Announcements: Mailed to 200 of your closest neighbors alerting them of the listing so they can help pick their new neighbors and spread the word about the new listing!! 14. Relocation: Offer the services of RELO and CRS networks by distributing your property information to corporate and relocating clients from around the globe. 15. ChoiceOneProperties.com: Home page exposure on our company site!!! 16. Your Property's Own Website: Develop a custom website with photos, tours and details. 17. Open Houses: Complete with numerous signs, refreshments, Facebook and internet marketing plus personal neighborhood invites to maximize attendance. 18. ListHub: Syndication of the listing in dozens (70+) other web sites i.e., Google, NextDoor, Trulia, Yahoo, Oodle, AOL, Homes and Land, Realtytrac, HGTV and more!! 19. 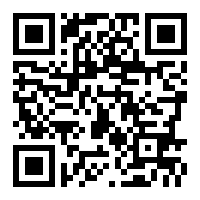 Feature Your Property on Facebook: Your listing will be posted on the Business page of Choice One Properties until SOLD!! 20. IDX Feed: Potential buyers can find your home even if they are shopping on another Broker's website with our exclusive IDX feed through the MLS. 21. Reports/Updates: Send you listing activity reports bi weekly updating you on marketing/activity received. Personally conduct a review of your listing every four weeks. 22. Honest Feedback: We'll check the lockbox daily and promptly follow-up on all showings. 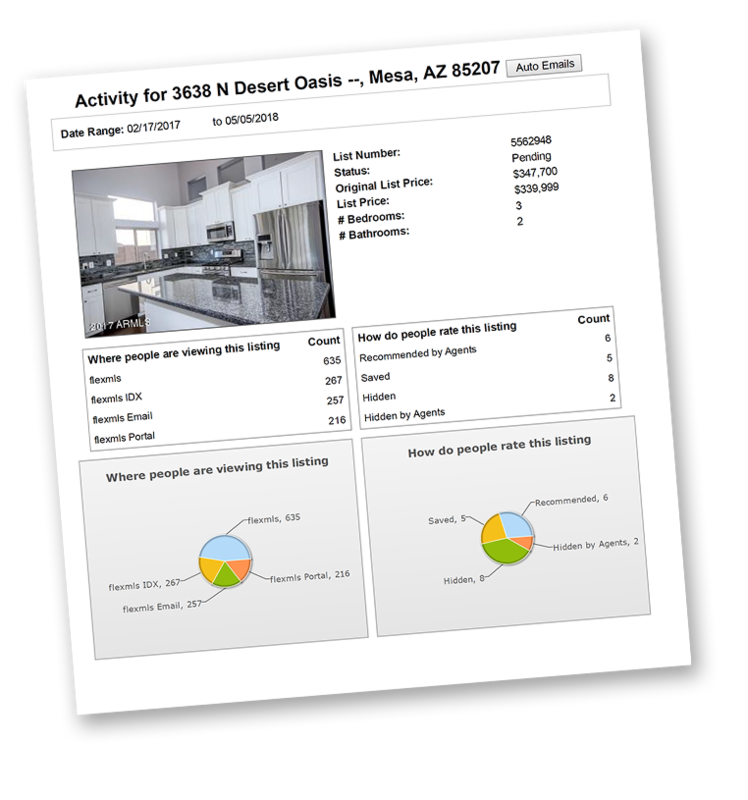 You will receive feedback through your listing reports and/or emails. 23. Networking: Network with agents who have nearby listings as well as qualified buyers to be sure they have accurate information and that agents know how to show your property. 24. Market Conditions: Review market conditions and activity constantly and recommend necessary adjustments regarding marketing and pricing strategies to get your property sold! 25. Buyer's Agents: We have full time licensed agents on our team who show our listings first before showing any other MLS listings to their buyers. 26. Prequalified Buyers: We prequalify all buyers before showing them homes. 27. We Answer the Phone: Sounds like a simple concept! Our phones are always forwarded to Cathy as well as our agents evenings and weekends--we are always on call!! 28. Write/Evaluate/Advise and Negotiate Offers: Represent you on all contracts and negotiate the best price, terms and conditions appropriate for today's market including the best protection clauses! 29. Loan Verifications/Closing Cost Analysis: Verify all loan balances in advance to prepare a detailed net sheet for you upon negotiations of any offer and confirm any prepayment clauses. 30. No Hassle Cancellation: If for any reason you are not satisfied with our marketing or services, we will cancel your listing at no charge to you. Just put your request in writing. 31. Advance Fees: We do not charge any fees or commissions up front. 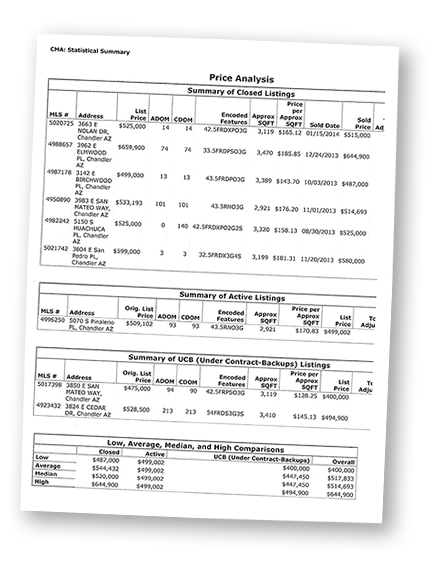 We only get paid when we sell and close escrow on your property. 32. Customized Programs: We can customize a marketing plan and commission structure suitable to meet your needs and expand it as necessary to promote your property. 33. REPEAT many items above: When there is a price change or other big updates regarding the property, many of the above items will be completed again! 34. Pre Marketing: New trends show “Coming Soon” listings get a jump on the market, including internet exposure on Zillow.com as well as a “PreView” Open House.